The challenge was simple. 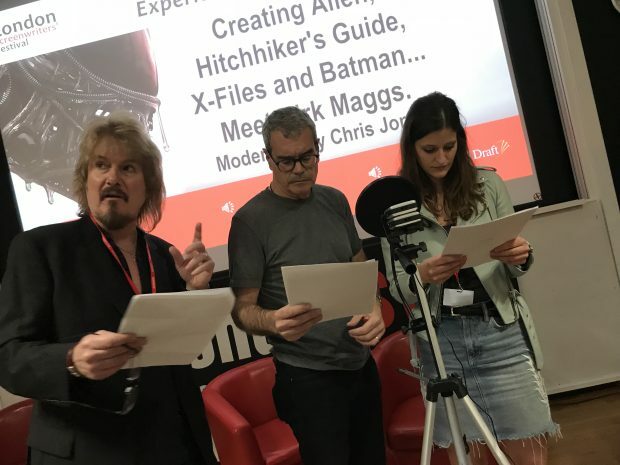 Write a two page script set in the Alien universe, we would select the best, then during our session with Dirk Maggs at the festival, we would perform, record AND master during the session. Dirk is a world class expert in radio drama that is bang whizzy and high concept, and a tremendous speaker to boot. More on Dirk in later blogs. He was backed up by our two amazing cast members, Mark Arnold and Nina Rubesa, as well as sound designer and editor Simon Reglar. The script we selected was Alien: Airborne by Kendal Castor Perry and you can read it HERE. It was written as two pages then once chosen, we needed to expand it to make it more audio friendly. Something we learned in the process. Dirk would also chime in that there could have been better ways to do this too. We recorded the sound on a Roland R-05 which is now replaced by the R-07 which goes for £175 or so. If I were buying today I would likely go for a Tascam DR-05. Amazing kit for the price. We recorded in the cinema with a full room of people, so acoustically, the room was as ‘dead’ as one could hope for. Of course, we could record under a duvet or in a car, both amazing DIY studios suggested by Dirk. We had a tripod and a pop shield which cost a fiver on Amazon (to stop breath hitting the mics). 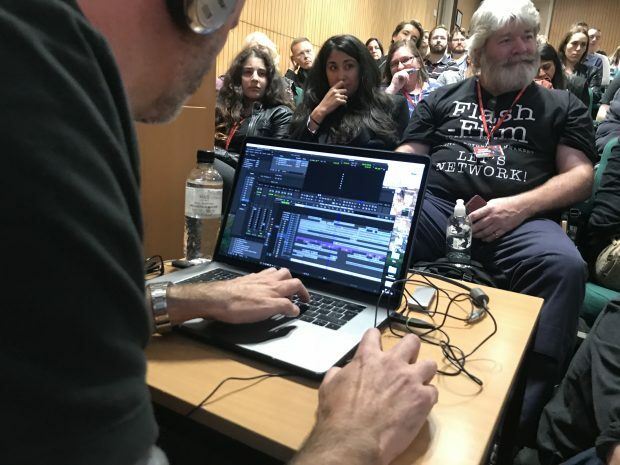 It was recorded to an SD card and given to Simon who then edited it on Avid (his choice) but other free tools for sound mastering were discussed such as Audacity. We recorded stereo, and 48khz 16bit for speed but could have easily recorded at higher resolution. We pretty much dove right in, recorded the audio, then handed it to Simon who did all the Audio work live in the session. He had prepped sound effects and music before (which he had done on the train going to work and coming home over the few days prior). At the end of the session, we dimmed the lights and watched in the dark. Of course it’s not perfect and we would all – actors, writer, editors… do it differently knowing what we now know. This session was about ‘what can be achieved in a few hours?’ And WOW! Listen with headphones in the dark. A-MAZING! Kendall, the writer, will be writing a more detailed blog in due course, but for now, marvel at what we did between 7:45pm and 9:15 pm last Friday night, with basic kit and a load of imagination. Lucy Hay also read the shortlisted scripts and offered feedback below… Our two other readers didn’t offer detailed feedback, just thumbs up or down. We were after all days awar from the festival. A compelling reimagination of the spore-like Xenomorphs we saw in ALIEN: COVENANT and *that* iconic unproduced draft of Alien 3 (set on an Asian space station, with Hicks as protagonist) that can still be found floating around. Visual, with icky horrifying flying sperm (this writer seems to like his bodily fluids! Ahem). Love the idea of a human shield and ‘old’ Xenomorphs who change. Not sure how it would come across as a radio play on stage when so much of it is not acted out by the two main characters, however. Two passenger crew must deal with a Xenomorph breaching their security, at the same time as disarming the computer going into self-destruct. The twist? One of the passengers is infected. Not sure what ‘Mamertine’ is – computers in the Alien universe are normally called things like ‘Mother’ or ‘Father’. Made me think of MC Hammer, ‘Hammertime!’ Unfortunate semantic noise. Good to see some diversity here: the main character, Mazu, is a woman of colour and more than capable, like Ripley before her. Two crew must deal with an Xenomorph invasion, only one can survive – the woman, who is carrying humanity’s last surviving (human) foetus. A simple and effective concept, though seems at odds with the Alien universe that it’s a man who saves the day, especially when he sacrifices himself because this makes Flic a damsel, especially when she was clueless about her own pregnancy, too. A clear ALIEN fan though: the script talks of pulse rifles and the dialogue is totally on point. Original idea about a man being tortured by a female interrogator with Alien blood, whilst being forced to watch the alien on a projector. The highly sexualised female interrogator feels a little off-kilter for the Alien story world, which has never featured such a character. Also not certain why the man was being tortured for the name, or why he had to die. Great gore here, with some nice visuals. Two crew must deal with a Xenomorph breaching the ship, only to learn their own AI has turned against them and is helping it. Great idea, in keeping with the Alien story world and very reminiscent of Ash in the first movie, or Michael’s actions for the engineers in Prometheus. Some impact is lost via the fact the scene is dialogue-lead in us finding this out, in comparison to other entries; plus the computer’s beef with the humans didn’t seem ‘enough’ for it to kill them in my humble opinion. A crew member listens to his dying colleague over the radio, satisfied both Xenomorphs on his scanner are with her – but of course one has crept into his pod. An effective idea, in keeping with the Alien universe; we are well used to Xenomorphs creeping into spaceships undetected! Klaasen is clearly modelled on Burke from ALIENS, but seems a little *too* evil – Burke was a jobsworth and a coward, but we have all met guys like him. Still, an obvious Alien fan with all the references to steam vents and Xenomorph hissing, plus this could work very well as a radio play. Two crew members are attacked by Xenomorphs. When one is injured, she uses it to her advantage, as the Xenomorph attacks the more able one. An intriguing idea, but this seems at odds with the Alien story world, where women are always heroes, never cowards who ‘arrange’ the death of crew mates to save their own skin. She does get her just desserts though, when the computer blows the ship regardless. Also contains one of my favourite bits of scene description, possibly ever: ‘[She] slips on the entrails of a former crew member’! A crew member awakes from cryo-sleep to his worst nightmare: a terrorist synthetic has planted Ovamorphs (Xenomorph eggs) on the ship, so aliens are running riot. The Terror-synth needs repairs, so saves him from the aliens, but to no avail and they are both killed. Written by a clear fan of the alien story world, the writer has built on it effectively: I love the idea of a terror-synth! The script loses impact because it is dialogue-lead in comparison to some of the others, which were more visual. Also seems to end abruptly. A marine must extricate a young woman from cryo-sleep, who won’t leave her ‘sisters’ – who turn out to be Xenomorphs (who are, you remember, all females). Though Hana appears to be a damsel, this expectation is cleverly twisted around when she kills her rescuer at the end, meaning she is more complex than first appears. Though Hana is not a hero, as we might expect in this storyworld, she is still in keeping with the Alien storyworld in that Ripley was also a clone/alien hybrid in ALIEN RESURRECTION. Clear Alien fan, great visuals. PS – We do hope to update the file with a proper intro, this one still has the into by Bob. And with credits.